Whatever you want really. Arakhali is great for the Bloodrage + IC combo that we use and its increased recovery rate. Gharukhan for runspeed + more evasion synergises also quite well as does the poison immunity one. Anything really. Like Cyrix said, Arakhali works great with Blood Rage and IC with our leech. I usually end up changing mine depending on what I'm currently doing. For example, if you're going to do Uber Elder, you may want to take the Brine King and Yugul. Gruthkul is a good defensive choice. Lunaris and Solaris are also good choices depending on what you're currently doing. If I'm not doing anything in particular, I usually keep it on either Arakhali for the recovery or Solaris for the reduced crit damage and 50% ailment chance. I also usually use Gruthkul unless I need to change it for something specific. How is this build doing against big chaos damage? Can Tora oneshot on T16 maps? The only time I had an issue with any of the Syndicate encounters was at the start of league when before they were rebalanced. Now though, they all die pretty quickly so I don't worry about a thing. Because SA doesn't play well with doorways, for the fortress encounters, I usually start a Phase Run, run into the middle of the thing and launch SA and usually things die pretty fast. Other than doing that, nothing in the Syndicate encounters has been an issue. Also, in the underground research labs, RoA works better than SA because of all the doorways. This will be fine as a league started because it will work without expensive gear. You don't need the double socket Abyss gear or the T1 rolls on the jewels. Cheap under 15 chaos jewels with a little phys damage and a little life will work. And because it's clears so fast, it's a good farmer to make currency. As for leveling, you can level any build up fairly quickly using RoA. You don't even need to tweak the skill tree from whatever your end game tree will look like. Here's a video guide on the basic gear to use. I used this method with a Jugg this league and didn't bother to modify my end game Jugg skill tree and this method took me into maps no problem. I did this build at the start of last league which ended up funding a pricier Jugg CI MS build (which I didn't like as much as this build). As for leveling, I used the guide I refereed to in my previous post. Using that gear, you can get into maps and farm currency pretty easy. Once you have the Doomfletch Prism and Shroud of Lightless you can switch to this build. Like all leveling, be sure to start leveling the gems in your second set of weapons while you're using the other gear that you'll end up using for this build. DoomFletch Prism and Shroud of Lightless are the priorities. Then, the 2 Might of the Meek jewels along with cheap-ish abyss jewels that have phys damage and life on them. Unnatural instinct is a bonus but I'd focus on that last. As for other gear, get phys damage, life and res to cap res. Use rare gear with those mods until you can get 1-2 socket abyss gear and maintain good life and res. Once you have the Abyss gear then you can focus on getting better jewels. 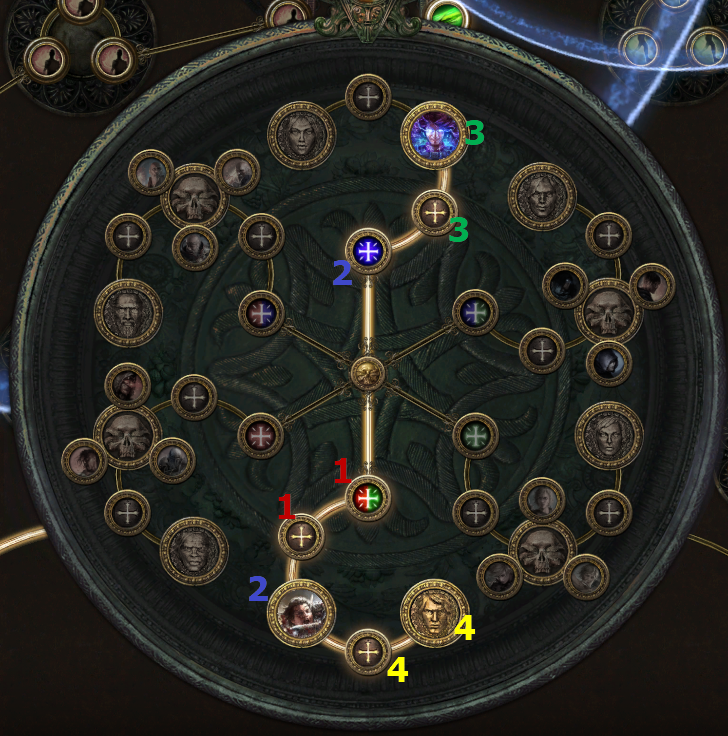 For Ascendancy nodes, I took them in the order in the image below. Just connect the tree at Bravery until you do your last lab. Because Zana's mods won't have Abyss next league (AFAIK), the helm, gloves and boots may be harder to get. Single socket Abyss gear is fine, and even rare gear with good phys damage and life should also be OK. I did uber elder in the high 80's with a rare helm and single socket tombfists and bubonics so that's only 2 Abyss sockets away from using all rares in those spots. It was me, thanks man! Cleave + MS til lvl 12, use warbanner for single target boost. OR start ranger as a mule to get bow + shrapnel shot + pierce. Lvl 12: Swap to RoA with added lightning and maybe keep using chance to bleed. Can't really use onslaught because lack of early damage. Craft a phy bow with the rustic sash recipe. After getting lvl 16: Get HoI+HoT+HoP to greatly boost your dmg, I feel like HoA is the "worst" herald, what do you think? Start to use after I obtain enlighten lvl 3. Use live search on Vaal RoA and Storm Cloud, maybe try to snag other leveling uniques depending on drops. After reaching blood aqueduct, farm tabula cards and/or enough currency to buy it, progress to maps, progress atlas and make currency to buy Shroud and other abyss items. What do you think about this early leveling tree? After progress towards Primeval Force, Winter Spirit and other bow nodes, grabbing life nodes when needed. Doomfletch prophecy should be quite cheap early, should I still use it without Shroud? Thinking yes because we want to utilize added phy abyss jewels.